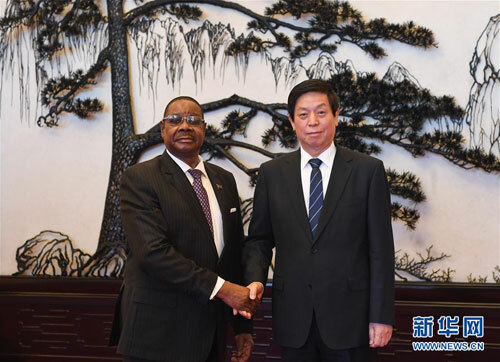 BEIJING, Sept. 1 ,China's top legislator Li Zhanshu on Saturday met with Malawian President Peter Mutharika ahead of the 2018 Beijing Summit of the Forum on China-Africa Cooperation. Li, chairman of the National People's Congress Standing Committee, said China supports Malawi's independent development path and is willing to strengthen the exchange of experience in governance and pragmatic cooperation in various fields. Mutharika said he is proud of the development of Malawi-China relations and hopes to further strengthen cooperation with China and promote bilateral relations.